It seems like simple respect, common courtesy and consideration for others is getting lost. In the past when I’ve broached this subject I have mostly focused on basic rules and responsibilities. My thinking was that most violators were simply ignorant or uneducated. I’m sure that is still the case for some but I fear this has changed in recent years. There are some elements of our society where individuals are totally focused on themselves without regard to what others think or how their personal behavior affects others. I had hoped that fly fishing was somewhat immune from this attitude but after reading all of the posts and responses I can see that there are some who do not care how their actions impact or affect others. In my effort to elicit responses I shared my latest peeve which is loud music being played from drift boats. Until this past summer I had never experienced this. In and of themselves, drift boats have an impact, especially on wading anglers no matter what they do. On the Facebook post I didn’t expect so much focus on the loud music issue. My thought was that others would share examples or experiences of a variety of issues relating to basic etiquette on trout streams. There were a number of important concerns including trash on the river, crowding, uncontrolled pets, boats cutting other boats off, and blocking boat ramps. As expected there were a lot of comments about guides and guiding. I plan to address this in another blog at a later date. Out of 118 total comments over half were focused on the issue of playing loud music. The point I hope to make isn’t about playing loud music on the river. In fact I could care less if you want to play music as long as I don’t have to listen to it when you float past, music that is loud enough that I start to hear it when you’re still several hundred yards up the river. A couple of posts stated that there should be a class or a brochure with rules of etiquette as a requirement for anyone using the river. In my mind we don’t need another layer of bureaucracy. This problem has moved from not knowing how to behave on the river to not caring. You can’t teach attitude. The question that should be asked is why do you fish? I think for most of us fishing encompasses much more than just catching fish. For me fly fishing is peace. One definition of peace according to the dictionary is: “freedom from disturbance; quiet and tranquility.” Synonyms: tranquility, calm, restfulness, peace and quiet, peacefulness, quiet quietness, privacy, solitude. Most of us in my generation have a framed copy on our wall of one of the best pieces ever written about why we fish. It was written by John Voelker under the pen name Robert Traver. A former Michigan Supreme Court Chief Justice, he was best known for his book Anatomy of a Murder. There were some comments on my Facebook post that were not about behavior. For example some said there are too many crowds. Sadly another said if you’re not a resident, stay out of Idaho. Crowds are here to stay. There are some who want people regulated but they want everybody else regulated except them. 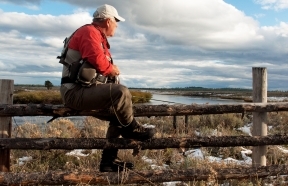 We have to learn to accept the fact that there will be more people on our trout streams. With this in mind we must make more of an effort to be considerate, courteous and respectful of others. There is no place for the “me above all else” attitude.